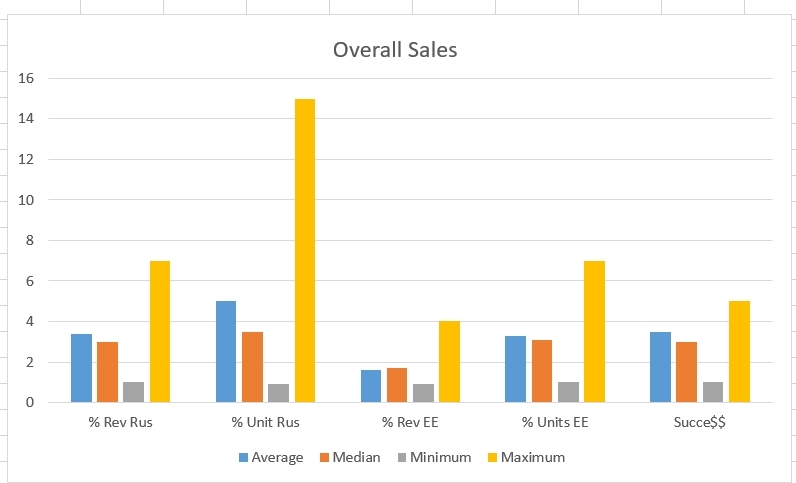 What Affects Indie Game Sales in Eastern Europe? It included games from various genres, with varying levels of financial success, and generally no marketing efforts spent on the region. 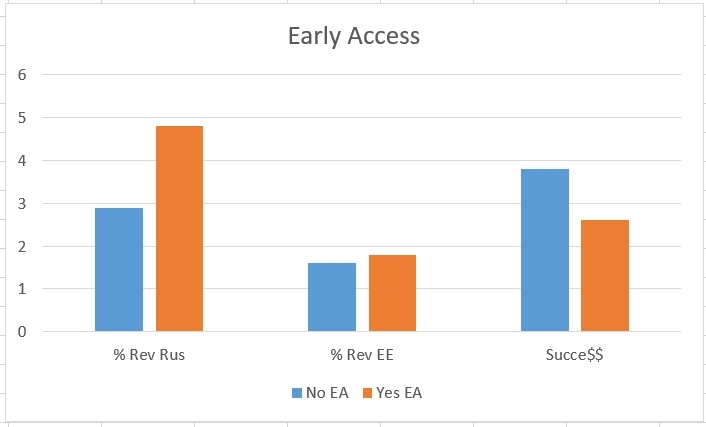 Early Access games are generally rated 5 points higher in Steam User Reviews than non-Early Access games. Hmm. I guess that fan-listening-thing really works. 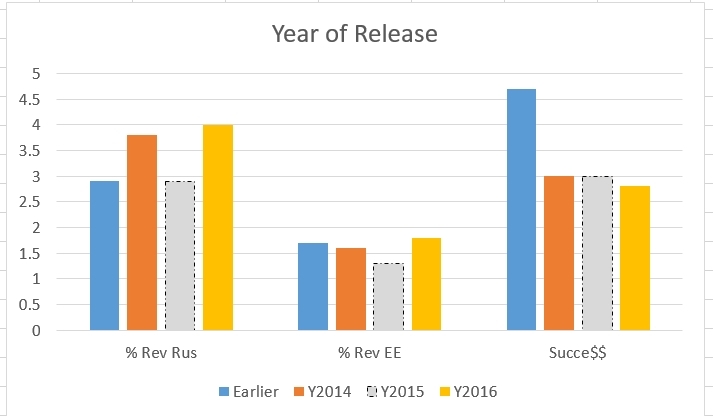 “% Rev” means overall, how much of your total revenue from the game so far was from Russia or Eastern Europe (EE)… not how many units sold. Raw dollars. Err, rubles. If a given category (for example, games with released console ports) has 3 or fewer entries, I have faded out that bar. It should be considered anecdotal. 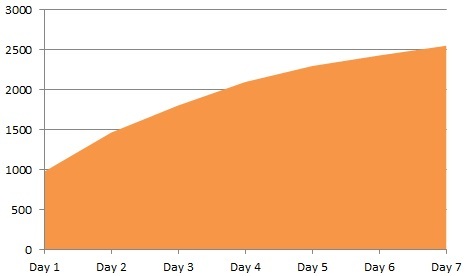 “Success”: It’s worth noting that the scale of that final category isn’t quite the same as the others — “Success” (again, self-reported, and simply “how well did/will this game make back its money”) had a minimum of 1 and maximum of 5, while the others are a percentage, therefore a minimum 0 and theoretical maximum of 100. 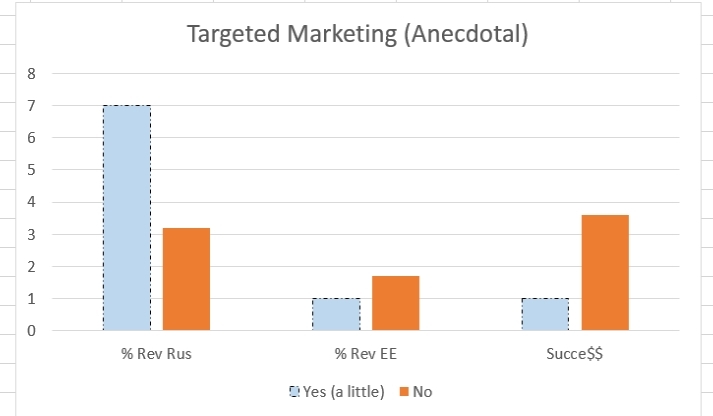 But in general, it looks like the respondents in this group made back their money (average of ~3.4).. that alone indicates we probably do have a skew. Anyway, moving ahead. I wondered if Russia was growing or shrinking over time. Doesn’t seem to be a huge difference, except that maybe Russia has become more interested in Steam since 2014… but if so, the rest of Eastern Europe hasn’t followed. What Steam Tags Do Your Game Have? 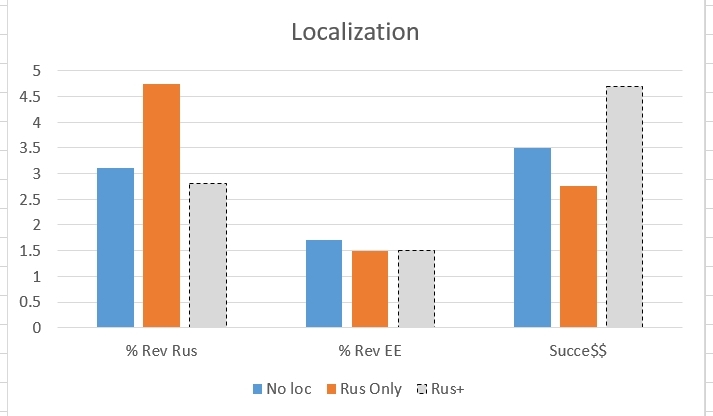 Someone also noted that their game included a free competitive tactical demo, which had 14% Russian units downloaded and 3% EE units, even without translation. 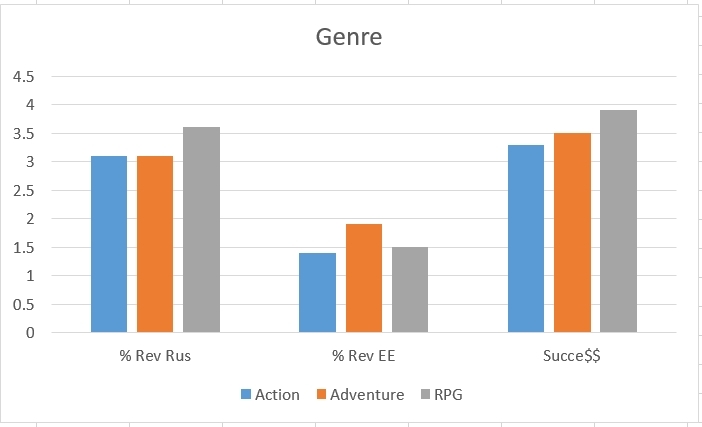 So that seems like an interesting outlier… either in genre, price, or some other element. Early Access does well there, maybe? Or maybe the later the game, the more likely they’re Early Access, and simultaneously the more Russians are on Steam. 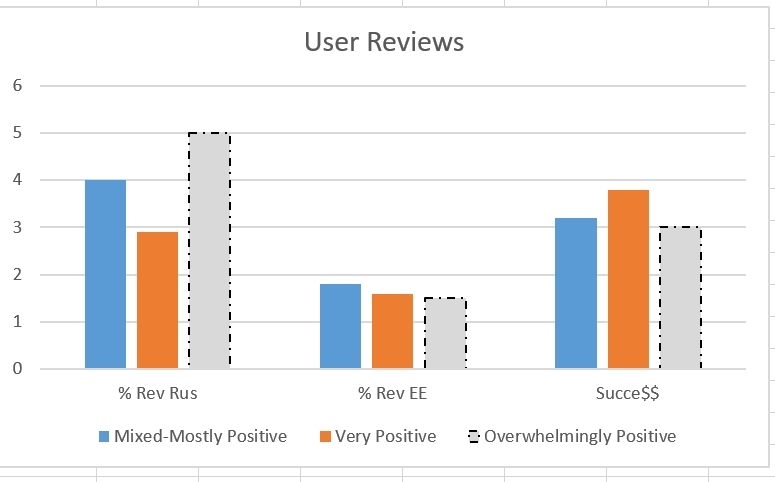 However, it made me curious, so I decided to use this opportunity to do a cross-analysis of mobile vs others, and found that although their user reviews were on average a full 8 points lower (72.5 vs 80), their reported success was a full grade higher. There were only 4 mobile entries, so take that as you will, but it’s interesting. 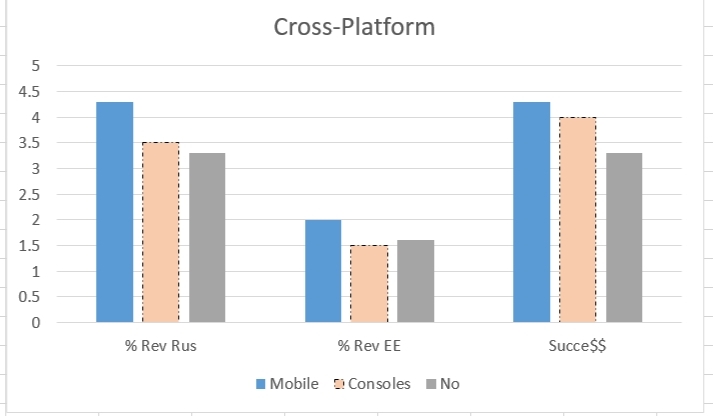 The mobile-cross-platform games also came out roughly a year earlier (2013 vs 2014). So is it a case of popularity begetting popularity? Some might wonder if a globally popular game will be especially popular in Russia or not. It doesn’t seem clearly correlated here, though there were only 2 Overwhelmingly Popular entries. In retrospect the survey should probably have asked questions about pricing (not just base US price, but localized Eastern European pricing) and discounts (lowest price-point, etc). Other than the knowledge that the games were not free to play, I can’t comment on that factor. Survey Results Are In: Classes Ahoy! Thanks to everyone who voted. I promise we read every single written “other” entry, but feel free to comment below if you want to keep giving us more input! Let’s Play by Quill18– 23,000 views and counting! Let’s Play by SplatterCatGaming– 8,000 views and counting! Lots and lots of Let’s Plays! Plus, for fun, Tanya had an interview with IndieGraph! We’ve sold over 2,500 copies across all platforms so far, so thank you to all of our fans for a great launch week! 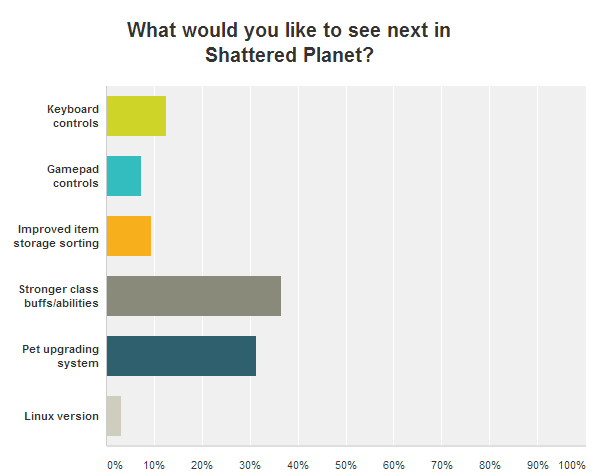 We’re looking forward to continuing to improve Shattered Planet with this great community to help us out. We probably can’t afford to commit to any huge additions at this point, but we have a few improvements in mind, such as keyboard controls. We’ll also be ramping up development of Moon Hunters, so keep an eye out on our weekly livestream on Friday afternoons (Eastern time) and watch the transition from concept art to our prototype development! 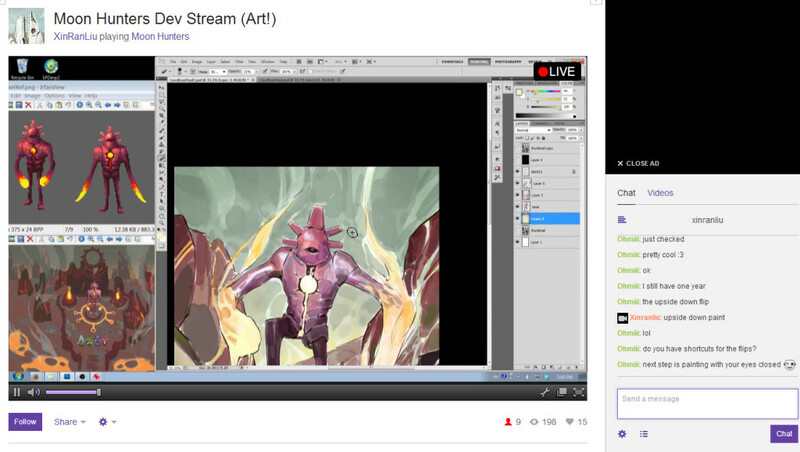 Join Us Today: Concept Art Live! Launch Date Announced: July 3rd! 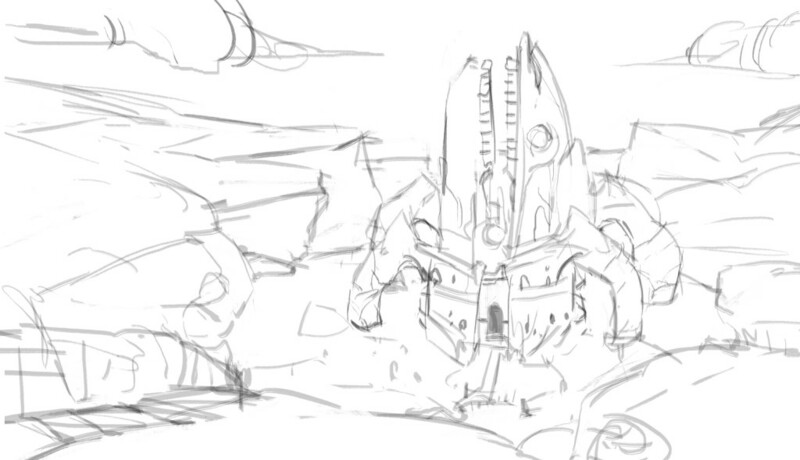 Shattered Planet is coming to Steam, Desura, and Humble on July 3rd for PC, with Mac following on July 17th! Both will include Steam Achievements and Steam Trading Cards. Humble and Desura will offer a DRM-free option. If you have any questions or excitements to share, the forums aren’t so far away! Screenshot Contest: Everyone Gets a Key! We’re going to give ALL of the people who entered the contest a free Steam Key! So, congratulations all around! But, for the record, AxL Neo wins more than all of you, and will receive his Steam key first. By at least 10 minutes probably. Moon Hunters Has its Own Website! If you’d visited MoonHuntersGame.com previously, you might have noticed it was an empty shell. No longer! Xin put some love into the web design and now it has its own portal and blog. We’ll still likely cross-post Moon Hunters news here, and to its newsletter, so no need to change your bookmarks.. but if you want to immerse yourself in all Moon Hunters all the time, that’s the place to be! Spring Screenshot Contest: Win a Steam Key! Calling all photographers! We’re looking for some creative screenshots or photos of Shattered Planet! You have until midnight EST on May 15th to submit your best screenshot/photo — edited or raw! Share on our Facebook wall, Tweet at @kitfoxgames with it, or send it on over! The winner(s) will receive a free Steam key for the premium PC version! We will judge entries on creativity and appeal. Any captions submitted alongside will be included in judgment. 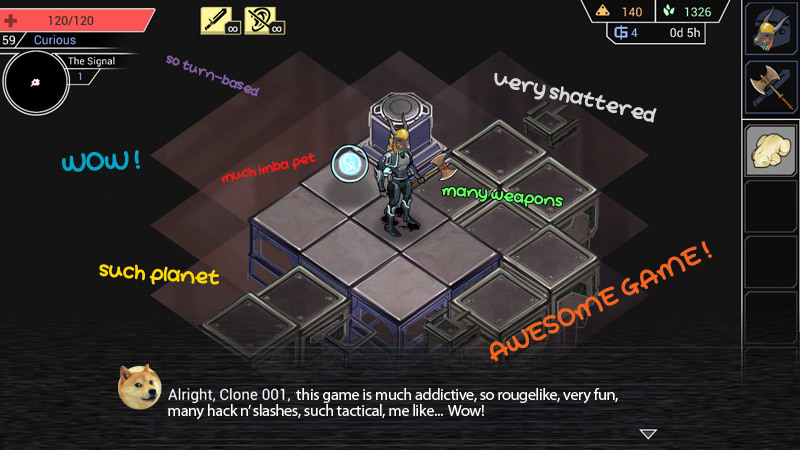 If you check out Shattered Planet (whether you’re on iOS or Android), you’ll find your space station has a visitor! Meet Dinaxi, who trades in Gekko Credits, which are now appearing mysteriously on the planet’s surface. Although Gekko Credits are unrecognised by the Galactic Union, Dinaxi will take them off your hands in exchange for limited-time only consumables, as well as a special armor, weapon, and gun. This event will end May 12th, so log in and start exploring! 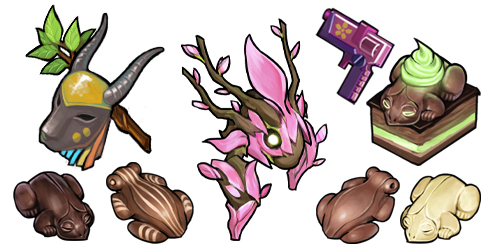 You can buy the Earthshaker Staff, which causes the ground to collapse under your enemies, or the Deer Mask, which makes animals such as the Nest Guardians and Hatchlings take longer to ‘notice’ you, or a variety of extra-delicious chocolate frogs, symbolising fertility and renewal on Gekk Prime. If you collect all five of the chocolate frogs, Dinaxi will reward your loyalty with a rare seedling companion she calls Sakura. Will you be able to find everything by May 12th? Wow wow wow! 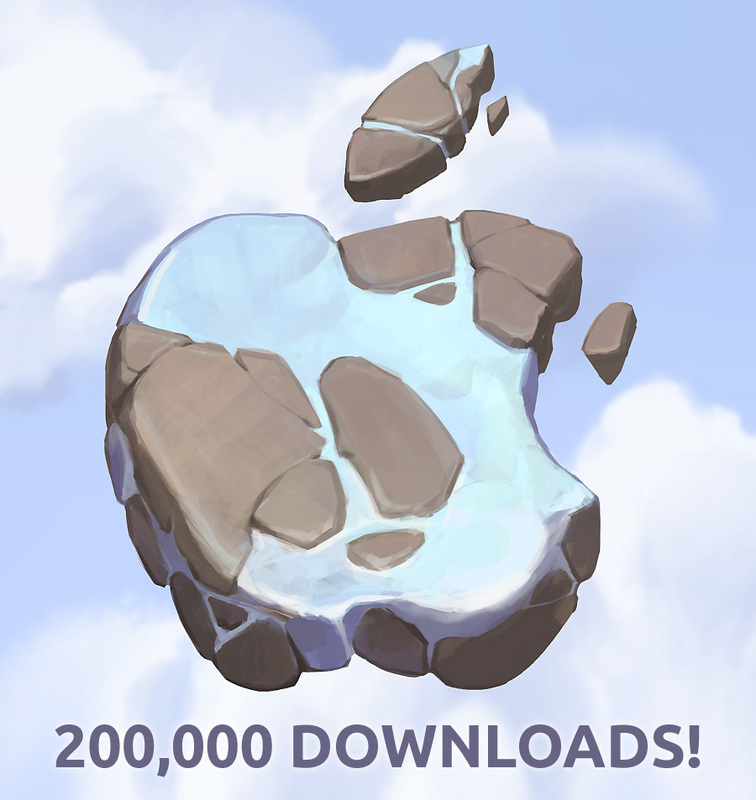 Two hundred THOUSAND downloads, just from Apple device owners! Now taking bets on how long it takes Android/Google Play to catch up!